The 2020 Jeep Gladiator has the body of an SUV and rear chassis of a pickup truck. 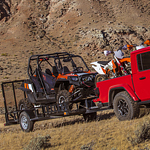 This all-new vehicle has impressive off-road and towing capabilities. If you're curious about the car's technical specifications, contact Lithia Chrysler Dodge Jeep Ram FIAT of Eureka for more information. The Sport is a base trim on the 2020 Gladiator's lineup. You can make an upgrade to the Sport S edition if you have extra money to spend. The Overland is a mid-level trim that has plenty of convenient amenities and robust mechanical features. If you want the best possible features, get the Rubicon edition. A soft top with the Black Sunrider label is available for this Jeep pickup truck. You can also get a three-piece hard top with the Freedom label. Most models come standard with 17-inch aluminum wheels that are paired with all-terrain tires. Some of the head-turning paint options that are optional for the Gladiator include Hydro Blue and Firecracker Red.